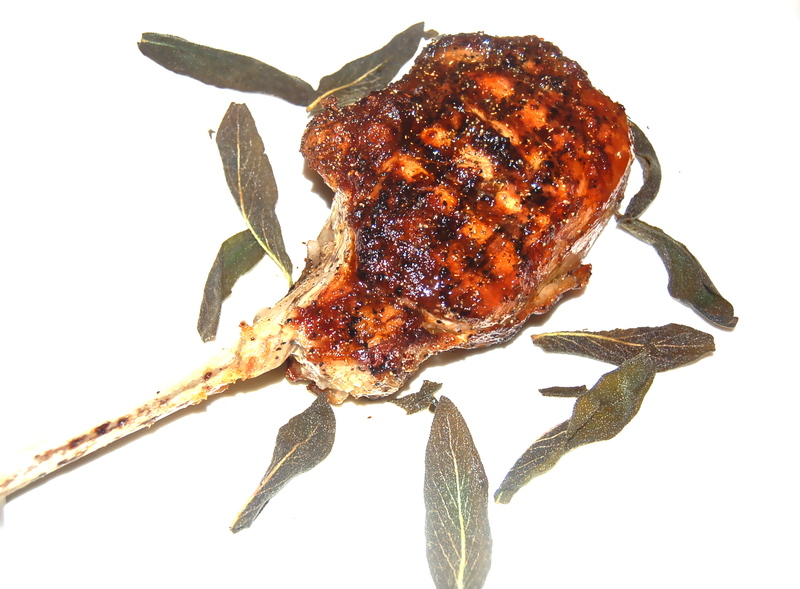 A Veal Chop is a quite expensive cut of meat, so it pays to be choosy about where it’s purchased from. Two of our reliable sources are Adam’s Fairacre Farm and Smokehouse of The Catskills. Last evenings’s chop was almost 2″ thick and weighed more that 1-1/2 pounds. A hefty chunk of Veal and well worth the hefty price. All that was done to it was seasoning, pan grilling and finishing in the oven. What more is ever necessary? 2. Season & Oil the chop. Heat a cast iron grill pan to smoking high. Add the chop weighed down with a meat press for 2-1/2 minutes, turn diagonally for another 2 minutes. Turn the Veal chop & repeat. A total of 4-1/2 minutes. 3. Move the grill pan to the hot oven for 5 minutes. The internal temperature at that point should be 125 degrees. 3. Remove from the oven & allow to rest for 5 minutes, before slicing & serving. 4. Fry the optional Sage Leaves in vegetable oil for 1 minute, dry on paper toweling & add to the plate.